NYC is about to adopt what some are calling “landmark” and “historic” legislation regarding open data. Does the hype match the reality? I offer the analysis below not as a critique of the City Council. I think they probably tried to negotiate as good a bill as they thought they could achieve. I offer it more as food for thought for those of us who will be seeking the data that may eventually become available because of the legislation (and for those of us who rely on data that’s currently available that may become less so due to the bill). Hopefully my concerns represent a worst case scenario. If the bill’s implementation indeed lives up to the “landmark” status bestowed on its passage, that would be a great thing. For example, the Council’s committee report on the bill [Word doc] suggested that substantial city data sets such as the Building Information System (BIS) or the Automated City Register Information System (ACRIS) would be made available in open, accessible formats due to the legislation. If that happens, that would be great. But for each of the handful of examples like that suggested at yesterday’s Council committee meeting, I could offer several more that I believe might escape the requirements of this bill. My overall sense is that somewhere during the two-plus years the bill has been on the table, the details got in the way of the original vision embodied in this proposal. And, as they say, the devil is in the details. If you’re interested in my take on those gory details, please read on. The bill is important, in a way. It’s an acknowledgment by the City Council (and the Mayor, if he signs it) that city agencies need to provide public access to data sets online, in a standardized electronic format. Some smart agencies have realized that posting data electronically saves money, time, and effort. By posting data online proactively, before the agency even receives a single FOIL letter (“pushing” it so people don’t have to “pull” it), it avoids having to respond individually to FOIL requests. So the City Council bill acknowledges that pushing is better than pulling. But will the legislation require agencies to post data online? To some extent, yes. But how far that goes depends on how it’s interpreted, and how aggressively it’s implemented (and perhaps how strongly the public reacts, since it seems like the only enforcement mechanism is public reaction). The first substantive part of the bill says that within a year, agencies need to post their data at the city’s online data portal. But let’s look closely at the language. Section 23-502(a) says that within a year, agencies don’t need to publish all their data to the portal. Only “the public data sets that agencies make available on the Internet” need to be included in the portal (emphasis mine). In other words, if an agency has refused to provide public access to a data set, or perhaps only allows access to that data after you’ve paid a fee and/or signed a license agreement, or otherwise hasn’t already posted the data online — that data is exempt. the agency shall report to the department and to the council which public data set or sets that it is unable to make available, the reasons why it cannot do so and the date by which the agency expects that such public data set or sets will be available on the single web portal. I’m not a lawyer, but it seems to me that if an agency doesn’t want to comply, it just needs to give a reason. And it needs to give a date by when it will add the data to the portal. The date could be two years from now, or it could be two decades from now. That part of the bill doesn’t have a deadline. Without aggressive support from the top — the Mayor and/or perhaps a new Chief Data Officer position with some teeth — agencies could just take their ball and go home and not play the open data game. And the public will be the worse for it without much recourse. Let’s be optimistic and assume that all city agencies (even the current holdouts – I’m looking at you, City Planning Department & MapPLUTO) decide to post their data online. The bill doesn’t say, or even mention as an option, that agencies can keep posting the data online at their own websites. Instead, it has to be posted on “a single web portal that is linked to nyc.gov”. But I’m not as enthusiastic as I once was for the portal approach (currently implemented here). Data for APIs, or people? At first I thought the portal would be so much better than the city’s earlier Datamine site. But the site seems to focus heavily on APIs and web service access to the data, which might be great for programmers and app developers, but not so good for people, like Community Board staff, or reporters, or students, or anyone else who just wants to download the data and work with the files themselves. Also, why not allow — even encourage — agencies to continue posting data on their own websites? I think that, in many instances, the individual agencies are doing a better job than the data portal. The files available for downloading from agency sites such as Finance, City Planning, Buildings, and Health are more up to date, more comprehensive (though still hardly complete), and easier to understand than what I can find on the portal. I think it would be ok if both approaches existed (portal and individual agency sites). But the way the bill is worded, I think the risk is that agencies are more likely to do only what they have to do or what they’re expected to do. Since the bill focuses on the portal, I think we may see individual agency data sites whither away, the rationale being why bother with individual sites since they have to post to the portal. With sites such as City Planning’s Bytes of the Big Apple (which is really great, with the exception of the PLUTO license/fee), I think that could be a big loss for the many people and organizations who have come to rely on the high quality data access that these agency sites provide. Hopefully I’ll be proven wrong. implement an on-line forum to solicit feedback from the public and to encourage public discussion on open data policies and public data set availability on the web portal. But if the current portal is the model for this online forum, I’m concerned. When I access data from the agencies themselves, I can talk with the people directly responsible for creating and maintaining the data I’m seeking. I can have conversations with them to understand the data’s limitations. I can discuss with them how I’m planning to use the data, and if they think my expectations of the data are realistic. To me, the portal is somewhat analogous to the city’s 311 system and the recent articles about putting the city’s Green Book online. Though 311 is great in a lot of ways, it has put a wall between the public and individual city agency staff members. Try finding a specific staffperson’s contact information via nyc.gov, like the New York Times recently did. It’s almost impossible; you have to communicate through 311. Similarly, the online data portal — if it ends up replacing agency websites as sources for online data access — will make it difficult to locate someone knowledgeable about the data. This widens the “data gap” — the gap of knowledge between data creators and data users. In order to know whether a particular data set meets my needs (if I’m creating an app, or even just writing a term paper), sometimes a written description of the data is not enough. I may need to actually talk with someone about the data set. But good luck finding that person through the data portal. And even when people have used the portal to submit online comments, I don’t know if anything ever comes of it. It looks like only 14 of the 800+ datasets at the portal have comments (sort the list by “Most Comments”). All of the comments raise important questions about the data. For example, two people offered comments about the HPD Registration data available through the portal. They asked “Is there any plan to expand it?” and “Could you help us?” Both remain unanswered. Maybe everyone who commented was contacted “offline”, as they say. Either way, this hardly constitutes a forum for public discussion. No public interactivity. No transparency. No guidance. It’s no wonder there’s been so little use of the portal’s button (and I use the term “Discuss” loosely). Another section of the bill has a nugget of hope. But the way it’s worded, I’m not too optimistic. In effect, this “summary description” (if it’s done right) will be the public data inventory that advocates have been pushing for (and which has been required by the NYC Charter since 1989). That’s a good thing. At least now we’ll know what data sets each agency maintains. Hopefully it’ll be a comprehensive list. I guess the list’s comprehensiveness will be up to DoITT to enforce. (And if the list comes up obviously short, perhaps some enterprising FOILers can point out — very publicly — where the holes are 😉 ). But that same section of the bill also says that the plan “shall prioritize such public data sets for inclusion on the single web portal on or before December 31, 2018“. So it still relies solely on the data portal. And it gives the city another 6 years to make the data public. As someone said on Twitter, “sheesh”! state the reasons why such [public data] set or sets cannot be made available, and, to the extent practicable, the date by which the agency that owns the data believes that it will be available on the single web portal. “[T]o the extent practicable”? When the agency “believes” it’ll be available? Wow. Those are some loose terms. If I ran an agency and didn’t want to provide online access to my department’s data, I’d probably feel pretty confident I could continue preventing public access while easily complying with the law. “Will be voted on and then passed”? I guess the full Council vote is pretty much a foregone conclusion. That leaves us to hope that the bill’s implementation will address the issues I’ve outlined above, and any others that advocates may have identified. Fingers crossed? In preparation for the Nov. 2012 election, many news organizations and others are linking to our interactive State Legislature and Congressional redistricting maps. We’ve posted examples at the Center for Urban Research website. We’ve updated our map of redistricted State Senate and Assembly districts, highlighting the differences in race/ethnicity characteristics between total population and voter-eligible population – in other words, comparing the characteristics of all those who live in the new districts versus the smaller group who will be eligible to vote for each district’s representatives. In some cases the differences are striking. Our examination of the district-by-district data is available here. New York State, like all other states, is in the midst of redrawing its legislative district lines. To help you follow along, our team at the Center for Urban Research has launched an interactive redistricting map for New York. We collaborated with The New York World to develop the maps (though we encourage anyone and everyone to use them!). Will you still be represented by the same State Senate or Assembly district you live in now? Will you live in the newly proposed (and controversial) 63rd Senate district? Is your neighborhood, town, or county going to be “carved up” by a new legislative seat? Will your community’s historical voting power be diluted by the new districts? We have some examples of gerrymandering at our Center’s website. In the meantime, here’s how you can use the maps. The current districts are on the left, and the proposed districts on the right. You can also click on either map to highlight the current and proposed districts. As you move one map, the other moves in sync. When you enter an address or click on the map, an info window pops up listing the current and proposed districts. You can click the link for the current district to go to that Senator or Assemblymember’s website. Switch between State Senate and Assembly districts. Congressional districts will be posted once the data is available from LATFOR. You can zoom in to street level, or zoom out to a statewide view. Switch between a street basemap or an aerial view from Microsoft’s Bing maps to see geographic details. You can share this on Twitter, Facebook, etc and email it to friends and colleagues. the vertical “before-and-after” slider approach. I blogged about the Comparinator approach here and here. John Reiser also gave the technique a shoutout at his “Learning Web Mapping” blog for Rowan University. With Census data, our “Comparinator” approach helped visualize changing spatial patterns of race/ethnicity trends – in cartographic terms, between two choropleth maps. With legislative districts, the comparison is between two sets of boundary files with no inner fill. So here we’ve set the side-by-side view as the default — we think the side by side maps give the easiest way of visualizing how the districts may change. But we also give you the option of viewing the districts with our vertical slider bar if you’d like, or the overlay. For the proposed districts, we used ArcGIS to create the legislative district shapefiles based on LATFOR’s Census block assignment lists. The current district boundaries are from the Census Bureau’s TIGER files (here’s the FTP page if you’d like to download the “lower” house districts — in New York, that’s the Assembly — or the “upper” house shapefiles — the State Senate). That said, newer approaches such as Leaflet.js enable more interaction such as mouseovers, so we’ve started experimenting with some impressive new tools. More to follow! great performance — not only for the district boundaries, but soon we’ll be adding election district maps to show voting patterns within each Senate and Assembly district. We don’t want to bother with creating pre-rendered tiles for this data. cartoDB will render it speedily on the fly. cartographic flexibility: cartoDB uses cartoCSS for map symbology and labeling. Though there are still some quirks with cartoCSS, it was easy to grasp and it’s basically just CSS, so it makes styling easy if you’re familiar with modern web design. And cartoCSS incorporates scale-dependent rendering as well as attribute-based symbology, which makes it powerful and flexible. CartoCSS can be implemented using the cartoDB management interface, or programmatically. easy data management: if you know SQL — and even better, if you’re familiar with SQL commands with PostGIS — you can quickly and easily modify tables, filter data, and perform spatial operations. (The screenshots at the cartoDB github page offer some examples.) Very cool. scaling: cartoDB uses PostGIS and makes use of Amazon’s platform. So if our maps go viral, we’re ready for the usage spike! open source: if you want to manage your own instance of cartoDB, just download the code and go! Big props to Vizzuality for an amazing geospatial toolkit. LATFOR, the state’s redistricting task force. Whatever you think about their redistricting process, they’ve done a great job with open data. They’ve not only posted the list of Census blocks that make up each proposed legislative district. But they also posted a wealth of data at the Census block level and also at the election district level (with a crosswalk between EDs and Census “voter tabulation districts”). This data is indispensable for visualizing, analyzing, and (hopefully) making sense of the new districts. Dave Burgoon and the CUR team. Dave put together the redistricting mapping site in record time. Although it’s based on work he had already done with the Census Comparinator maps, it still involved substantial modifications and enhancements. But he made it happen as professionally and elegantly as always. The New York World. We had been planning to create an interactive mapping application to build on our Census Comparinator site and to help people visualize the impacts of the redistricting process and demographic changes more broadly. But the World team – Alyssa Katz, Michael Keller, and Sasha Chavkin – met with us a few weeks ago to discuss how we could collaborate on analyzing and mapping the upcoming district proposals from LATFOR. The discussion inspired us to roll out a mapping site specific to New York State and focused on comparing the current and proposed districts. We’re thrilled to be able to work closely with them on this project (watch for more maps and data in the near future!). The Hagedorn Foundation. The Foundation has provided funding support for our efforts to map and analyze Census data for a variety of civic engagement purposes, especially for Hagedorn’s Long Island-based grantees but also nationwide. Their support has been essential for us to develop innovative mapping applications like the NYS redistricting maps – not to advocate specific district plans one way or another, but to give local residents and others the tools they need to understand the impact of redistricting and hopefully get involved in the process. Our examination of the district-by-district data is available here. The New York Times gave our analysis a shout-out in their CityRoom primary election day column. You can visualize these proposed districts in relation to the current New York State Senate and Assembly districts with our new interactive redistricting map. We developed the interactive map in collaboration with The New York World, and here’s an article using the maps to describe the redistricting process in the Empire State. For more background on the interactive map, visit this blog post. 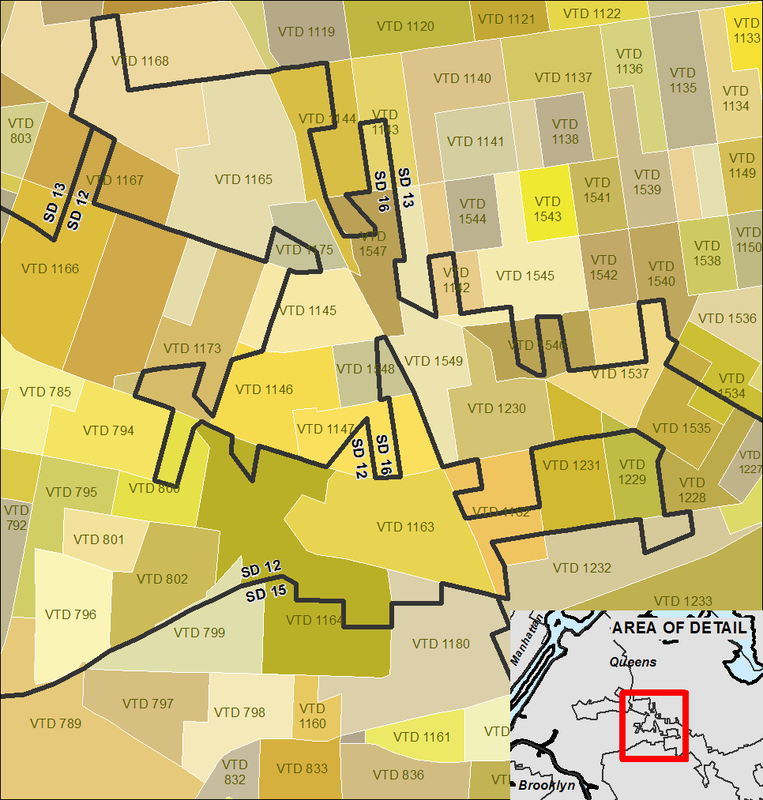 If you’re hoping to use GIS or any of the online mapping tools to map the legislative district lines in New York State that were proposed today by the state’s redistricting task force, you’ll have some work to do. The Task Force released PDF maps as well as “block assignment lists” for the proposed districts. Rob Goodspeed has an interesting post about his survey of the policies and practices of local governments in Massachusetts regarding GIS data. It looks like a good read. In my experience (in New York State), local governments can have more interesting GIS data (for example, tax parcels and real property records) than the state or Feds, but their data access policies and/or practices can be more limiting. There are major exceptions (NYC, for example), but even New York City requires a fee and restrictive license to access its property data. I look forward to reading Rob’s paper. Among other things, Rob is a PhD student at MIT. Nick Grossman of Civic Commons first alerted me to the paper via Twitter. Some NYC OpenData improvements – small but important victory! I noticed today that NYC’s new OpenData site (on the Socrata platform) has made some modest improvements since I blogged about it earlier this month, and since several people have responded to comments from Socrata’s CEO. In particular, many of the files listed in the Socrata/OpenData site as “GIS” files or “shapefiles” are now actually available for download as shapefiles. You have to dig a bit to find the download option — it’s not available via the button. You have to click the button, and then scroll down to the “Attachments” section of the About page. But in many cases, you’ll now find a zipped file containing a GIS shapefile. Small — but important — victory! When the OpenData site first launched, I was very concerned because there was no option to actually download most geospatial data sets — you could only access them as spreadsheets or web services via an API. That’s not very helpful for people who want to work with the actual data using geographic information systems. And it was a step backward, since many agencies already provide the GIS data for download, and earlier versions of the OpenData site had made the data available for direct download. It also seemed like it was extra work for the agencies and for us — extra work to convert the data from GIS format into spreadsheets, for example, and then extra work for the public to try to convert the data back into GIS format once they had downloaded a spreadsheet from the OpenData site. Seems pretty silly. It also seemed like it was an example of DoITT not understanding the needs of the public — which includes Community Boards, urban planning students, journalists, and many others who routinely use GIS to analyze and visualize data. Spreadsheets and APIs are nice for app developers — and the “tech community” broadly speaking — but what about the rest of us? If the city adds the shapefiles as a download option, that’s providing more open access to data, not less. But by not offering GIS data along with the other formats, the Socrata system seems to be limiting access. I’d hope that NYC would be as open and flexible and accommodating as possible when it comes to accessing public data. Socrata’s CEO seems to argue that with the Socrata platform it’s too hard to do that. If he’s right, maybe we should just stick with a tried and true approach — NYC agency websites already provide direct download of GIS data along with many other formats. But I know that we can do better. In fact, Chicago’s open data portal (also powered by Socrata) has offered many GIS datasets for direct download from Day 1. Actually, Chicago has 159 datasets tagged as “GIS” files, while New York only has 69 – what’s up with that, NYC? I thought NYC was the best in everything when it comes to open data? NYC’s landmarks data. The OpenData site describes this data as a “point shapefile … for use in Geographic Information Systems (GIS).” But it’s only available from the OpenData site as a spreadsheet (or similar format) or via an API. Waterfront Access Plans. The OpenData site describes this file as a “polygon shapefile of parklands on the water’s edge in New York City … for mapping all open spaces on the water’s edge in New York City.” But like the landmarks data, it’s only available as a spreadsheet or via an API. False advertising, if you ask me. But if you go to the source (the City Planning Department), the shapefile is there for all to access. So why is the Socrata/OpenData site any better? I’m still wondering that myself. And the Socrata/OpenData site still doesn’t provide the kind of meaningful data descriptions (or metadata) that you’ll get from agency websites such as Bytes of the Big Apple or Dept of Finance — data descriptions that are absolutely essential for the public to understand whether the information from NYC OpenData is worth accessing. But hope springs eternal — someone listened to our concerns about lack of actual geospatial data downloads, maybe they’ll also listen when it comes to everything else. Fingers crossed! @nycgov posted a tweet on Friday touting the map of WiFi hotspots on the new NYC OpenData site. I was impressed the city was trying to get the word out about some of the interesting data sets they’ve made public. It was retweeted, blogged about, etc many many times over during the day. The map is nice (with little wifi symbols marking the location of each hotspot). And it certainly seems to show that there are lots of hotspots throughout the city, especially in Manhattan. No metadata. The NYC Socrata site has zero information on who created the data, why it was created, when it was created, source(s) for the wifi hotspots, etc. So if I wanted to use this data in an app, or for analysis, or just to repost on my own website, I’d have no way of confirming the validity of the data or whether it met my needs. Not very good for a site that’s supposed to be promoting transparency in government. No contact info. The wifi data profile says that “Cam Caldwell” created the data on Oct. 7, 2011 and uploaded it Oct 10. But who is Cam? Does this person work for a city agency? It says the data was provided by DoITT, but does Cam work at DoITT? If I click the “Contact Data Owner” link I just get a generic message form. I used the “Contact Data Owner” link for a different data set last week, and still haven’t heard back. Not even confirmation that my message was received, let alone who received it. Doesn’t really inspire confidence that I can reach out to someone who knows about the data in order to ask questions about the wifi locations. No links for more information. The “About” page provides a couple of links that seem like they might describe the data, but they don’t. For example, the http://nycopendata.esri.com/ArcGIS/rest/services/DOITTServices/WIFIHotspotsWM/MapServer/0 link tells me about the web map service that I can use to display the map on my own site, but doesn’t provide any meaningful information about the actual data themselves. If I were to use the wifi data for a media story, or to analyze whether my Community Board has more or less hotspots than other Boards, or if I wanted to know if the number of hotspots in my area has changed over time, the NYC Socrata site isn’t helpful. Even looking at the map on its own, it’s not very helpful. Without knowing if the list of hotspots is comprehensive (does it include the latest hotspots in NYC parks? does it include the new hotspots at MTA subway stations? etc) or up to date (the Socrata site says the list of wifi sites is “updated as needed” – what does that mean? ), I have zero confidence in using the data beyond just a pretty picture. I’m sure if I clicked the “Contact Data Owner” link, eventually I’d get answers to these questions. But that’s not the point. The point is that the new NYC OpenData site bills itself as a platform to facilitate how “public information can be used in meaningful ways.” But if the wifi data is any guide, the OpenData site makes it almost impossible to meaningfully do anything with the data. The wifi data is another example of how I think NYC’s implementation of the new Socrata platform is a step backwards. Other NYC websites that provide access to public data — the City Planning Department’s Bytes of the Big Apple site as well as agency-specific sites from Finance, Buildings, HPD, and others — all provide detailed metadata, data “dictionaries”, and other descriptive information about available data files. This contextual and descriptive information actually makes these data sets useful and meaningful, inviting the public to become informed consumers and repurposers of the city’s data.